ANITA Business Computer (also known as the ABC). Power supply - AC mains. 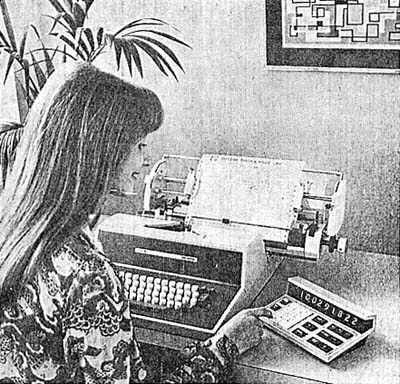 The Anita Business Computer combined a Triumph-Adler electric typewriter with an LSI calculator together with a considerable amount of electronics, all housed in a custom-designed desk. 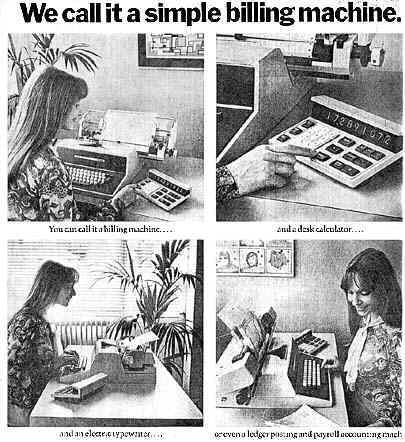 It was used as a "billing" machine. It was programmable to an extent and capable of taking a punched card reader, since an advertisement says "There are a series of specially selected programmes already prepared. Or, we will write a programme that fits your particular requirements. Then you can add a little and have your Anita upgraded to handle automatic card feeds ...". Made in England by Sumlock Anita Electronics Ltd.
"The Anita Business Computer was a general purpose accounting machine. Applications included invoicing, sales, purchase and nominal ledgers. There was also a program for solicitors' accounting departments. I seem to recall that there was a hook-up between Anita and Oyez, the solicitors' stationery company. In the early 1970's, RAM (semiconductor Random-Access Memory) or disk storage was not readily available, so the system worked by recording transactions on ledger cards. It was, more or less, a mechanised version of the manual 'Kalamazoo' card system. The 'output device' was a modified electric typewriter and it was possible to have a paper-tape punch unit. Paper-tapes containing sales data or transactions could be generated and these could be further processed by a more powerful mainframe computer. The ABC consisted of a desk, measuring about 5 feet long and 2 feet deep, which had a blue metal frame and a grey Formica top. An Adler electric typewriter with a form feed unit mounted on the carriage sat in the centre of the desk and the numeric display and keyboard was to the right. The logic unit, power supply and removable program chassis were all mounted at the back." Close up showing the keyboard and display unit, which resembles other Anita LSI calculators. Part of an advertisement for the Anita Business Computer, from 1973. The full image is featured in the Advertisements section. "Operating the system was pretty simple and began by dropping the ledger card containing the customers' account information into the form feed unit. The 'down' button was pressed and the mechanical gears and rollers lowered the document down to the next printable line on the card. It found this position by feeling for a small horizontal slot that was cut on the left side of the card. (When the transaction was completed, a new slot was cut as the card was being ejected, this marked the position of the new line for the next transaction). Information on the card had to be entered into the system – the Balance, the Account Number and a Check Digit number that was used to verify the information was correct. This was entered on the 'calculator' keyboard and the PROG key pressed. If the numbers made sense, the typewriter would print the date. You would then enter the value of the transaction, either a credit or a debit and press the PROG key again. The system would calculate the new balance, which it printed on the card along with the other transaction details and a new 'check digit' number. There were a number of variations to this theme such as manually typing a description of the transaction after the date was printed or the input of an invoice number, but the principle was the same. Quite often, two documents were used at the same time. The ledger card would be at the back and a thinner 'statement' sheet at the front. A carbon strip between the two transferred the information onto the ledger card. The statement, which contained that months' transactions would then be sent to the customer at the end of the month. It is worth remembering that the addresses on these statements had to be typed manually, so every month end there was a lot of work to do. The good news was that at least the balances could be carried forward semi-automatically. For invoicing, a simple 'tractor-feed' unit replaced the form feed unit, and continuous stationary was used. The actual hardware was a mix of technologies. The output device, the Adler 21D electric typewriter, was a standard unit which had a solenoid block mounted underneath, to trigger the keys. The typewriter was a conventional one, using type bars (as opposed to a golf ball). Adler were very big in this field and also produced, a few years later, their own accounting system called the TA20. The display and keyboard looked like an Anita 1011 LSI calculator. However, it used different components, although the case moulding was the same. The electronics themselves were based on the Anita IC calculator and consisted of around thirty printed circuit boards which were plugged into a hinged 'swing frame motherboard' which was mounted in a metal case at the back of the desk. The back of the desk had three sections to it. The left hand cabinet contained the power supply unit, the right hand side cabinet the logic/calculator unit, and in the centre, behind a hinged, locked door, was the program chassis. This was a metal frame measuring about 12" square that had a handle at each side so that the whole unit could be pulled out and unplugged. Mounted on this frame was a printed circuit motherboard' into which the program cards plugged. The program cards were circuit boards measuring about 8 inches by 2.5 inches onto which were mounted blocks of 5 diodes. Each block represented an instruction code for the electronics unit to process. To create a program, you had to cut out various diodes from each of the blocks. Removing a diode changed the value of that bit of the 5-bit code from 1 to 0. The actual creation of programs was undertaken on a more powerful development machine, which simulated the operation of the ABC. 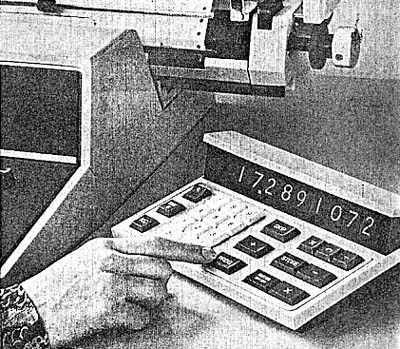 Once the program was proved, this machine printed out a chart for each of the program cards, showing which diodes had to be cut. Most customers had two or more of these program chassis, which could be interchanged to change the operation of the machine form say Invoicing to Purchase Ledger. One of the most memorable incidents in the history of the ABC was the need to stabilise the desk. When it was first introduced, the movement of the typewriter carriage would send the whole desk rocking from side to side. And this induced various malfunctions. The desk itself was quite long and had L shaped metal legs and a steel frame supporting the electronics at the back. To reduce the 'rocking', a 'stabiliser bar' had to be fitted to all the earlier units. This was a heavy steel bar with side plates which braced the legs and back of the unit to stop the desk moving. It was very heavy and took two men to fit. Although the ABC was a bit of a Dinosaur by modern day standards, a few were still being used in the early 80's. It wasn't until the PC became widely available that they lost favour. The big advantage of the machine was that a customer's account card could be viewed at any time, simply by pulling it out of the bin. It was the nearest thing to random-access memory and was multi-user too." ANITA Business Computer 2 (also known as the ABC2). "The ABC 2 was released a few months prior to Sumlock shutting down in 1976 and not many were sold. I can only remember one on our patch and it was used by a company called David L Clarke in Northampton. They did stocktaking for breweries and clubs. At the back of the machine, all the metalwork, which housed the program chassis, power supply and logic unit on the original ABC was no longer there. Power was provided by a 'bought-in' power supply box that was strapped on the back instead. This machine used PROMs (semiconductor Programmable Read-Only Memory) to hold the program(s), and these were mounted on a number of pcb's inside the case. This machine had a GO key to step the program on. The PROG key was used to select the program, as it was now possible to have more than one. The ABC 2 was a lot more reliable the ABC 1, however, it met a premature end because there were too few around and were difficult to get repaired, once Sumlock franchised off their service departments. Mostly they were leased, as the initial cost of around £6,000 was a lot of money. I seem to recall that Sumlock's parent company had a leasing arm called Paragon Leasing, which was more often than not used." Management in Action, October 1971, p34.